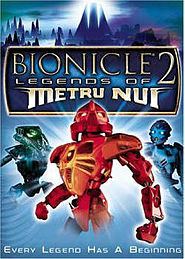 BIONICLE 2: Legends of Metru Nui is a BIONICLE movie released in 2004. It was the second movie released on DVD by LEGO. The movie tells the 2004 BIONICLE story. The movie shows how the Toa Metru manage to defeat Makuta. The six Matoran who turn into Toa with the help of Toa Lhikan, Whenua, Onewa, Vakama, Nokama, Matau and Nuju, imprison Makuta in Protodermis. They save the Matoran from being put to sleep, then being awakened again to serve the Makuta. They meet two Dark Hunters: Nidhiki and Krekka, which imprisoned Toa Lhikan and tried to destroy the Toa Metru. During the movie, the Toa discover their mask powers, which grant them special abilities while wearing their masks. In the end, the Toa save the Matoran, and reawaken them by using their Toa powers, turning themselves into Turaga. The movie was set before the events on the island of Mata Nui, some of which were depicted in the previous film, BIONICLE: Mask of Light. Facts about "BIONICLE 2: Legends of Metru Nui"
This page was last edited on 13 September 2017, at 09:11.